I'm not ready to say this move (reportedly for reliever Brian Stokes with the Angels paying all but $4 million $2 million remaining on Matthews's contract) completely spoils the "No Stupid Moves" theme for this offseason but it's not terribly great either. I am thankful they dodged the Bengie Molina bullet, and still think they'll look for a pitcher via the trade market especially after letting Joel Piniero go. F all once and future Cardinals. As for Stokes, he did a pretty nice job amid meager expectations, but I think it's good practice in general to shuffle these middle-reliever and bench types in and out with some degree of frequency. Thanks to the commenter in the below post who passed along the info, which seemed to eminate from a David Lennon tweet this afternoon indicating the the Mets' new reliever, Ryota Igarashi, will suit up in No. 18 this year. Lennon (and a good number of commenters at MetsBlog where the news was dissected and blown up in 45 seconds) focused in on what a crime it was to re-issue Darryl Strawberry's number -- as if they hadn't noticed they'd given it to Jeremy Reed, Art Howe and Craig Paquette, to name only three, in the years since Strawberry left town, and they all missed the real significance of the number to players from Japan. It's been a tradition in Japan dating to the 1930s to give an ace pitcher No. 8 or 18. Eiji Sawamura, the 1930s legend for whom Japan's equivalent of the Cy Young Award is named, wore No. 8 for the All-Nippon team that hosted a team of American stars for a 1934 tour that sparked the creation of a professional baseball league in Japan. Hall of Fame pitchers including Masao Date (an All-Nippon teammate of Sawamura's) and Motoshi Fujita were 18. The tradition carries to modern players like Daisuke Matuzsaka, who now wears 18 for the Red Sox, and Hideaki Wakui, who today wears 18 for Matuzsaka's former team, the Seibu Lions, and who this year won the Sawamura Award. The Mets issued No. 18 to their first pitcher from Japan, Takashi Kashiwada. The passing along of numbers with significance is in my opinion an admirable tradition in the Japanese game and is echoed in pro soccer where its common to see a team's top player wear No. 10. Thanks to Rob Fitts, a writer and Japan baseball researcher, whose collection of photos and baseball cards helped illuminate this post. Henry Aaron pioneered No. 44 as a number reserved for sluggers, and fellow Hall of Famers Willie McCovey and Reggie Jackson solidified the trend. 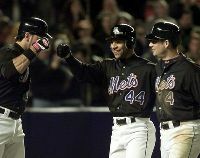 For the Mets, the 44 jersey has often found its way onto the backs of guys who only think they're power hitters. 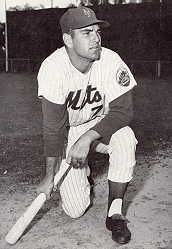 There was Jay Payton, who had all the muscle of a power hitter but a delicate frame and a line-drive bat. Ryan Thompson could hit it out of the park in interviews but was never as ferocious at game time. 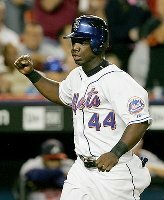 Lastings Milledge and his similarly powerful mouth wore out his welcome in less than two years (and only 11 Met home runs). 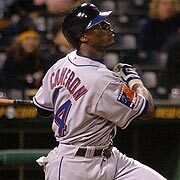 Mike Cameron slammed 30 home runs in 2004 but his hardest hit as a Met was a gruesome collison with teammate Carlos Beltran in 2005. What's a Met 44? It's Howard Johnson in May of 1991 switching to No. 44 in an attempt to jump-start his game, only to scurry back to his familiar No. 20 in less than a week when his wife reminded him her jewelry all included the No. 20. 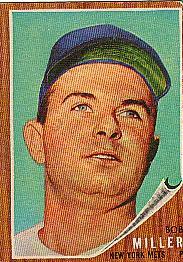 It was reserve catcher Harry Chiti, acquired from the Cleveland Indians in 1962 for a player to be named later -- Harry Chiti, and the Mets would get fleeced. 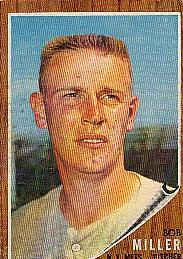 It was four different players as recently as 2008, and I can barely remember any of them: Brady Clark, Tony Armas, Eddie Kunz and Brandon Knight. 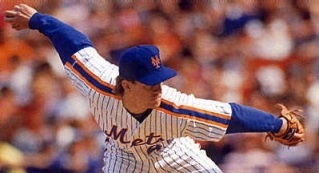 They threaten to join Kevin Lomon and Tom Filer and Bob Rauch, to name three Met pitchers who wore 44 in my fan lifetime and of whom I retain no specific memory whatsoever. 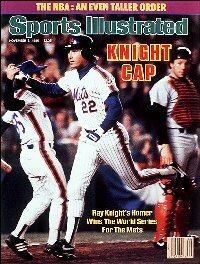 Like everything in Mets history, 44 was good for a stretch in the mid-1980s -- Ron Darling and David Cone each wore it before switching to other unis -- but it wasn't long before 44 was again the domain of guys like Tim Burke and John Cangelosi and Jay Bell, who I still can't believe chose sticking out to the bitter end of the 2003 campaign over retirement, or the Mets for allowing him . It's into this dysfuctional family that Jason Bay officially arrived in a Met press event today. Bonne chance, Jason! Ya gotta believe! Today's the day the Mets finally hold their first grip-and-grin session of the off-season, welcoming Jason Bay to Flushing Bay. We'll try to update you on the number he's issued at our first opportunity but I'll bet you a date with Suzyn Waldman he gets 44, which is already being pushed by the merchandisers at Met$.com and happens to be available. More interesting news may be what else the Mets say at the event today, regarding the catching situation (dare we court Yorvit Torrealba again?) and manuevers to acquire another starting pitcher -- I've long suspected the latter could come via the trade market. But we'll see. EDIT: 44 it is, or "two times Bobby Orr," as Rod Gilbert said. Whew. No date with Suzyn.